Running a marathon is hard. I’ve run exactly one, and in my opinion, that is enough to give me bragging rights for life. Knitting, while requiring less physical fitness and carb loading, is also hard, at least if the time I attempted to knit my then six-month-old baby a sweater is any indication. That poor child looked like an extra from Oliver Twist in his lopsided, dropped-stitch, sad garment. Parmalee, 22, has always been an avid runner, and she started running longer distances a few years ago. But she’s never run a marathon; this jaunt through New York City will be her first and isn’t that enough pressure? Why also knit? I had so many questions. It turns out that Parmalee has dabbled in knitting on and off since she was ten, when her grandmother first taught her how. Parmalee, who is a student at Northeastern University, took an internship at start-up company We Are Knitters, a yarn and DIY kit company, and her love of the craft was rekindled. She’s running the marathon and fundraising with Team in Training, which benefits the Leukemia and Lymphoma Society’s charity. While brainstorming with the We Are Knitters crew, who are donating $3,000 to Parmalee’s fundraising effort and sponsoring her for the marathon, she stumbled onto the website of university professor David Babcock, who holds the Guinness world record for “Longest Scarf Knitted Whilst Running a Marathon.” Inspiration struck. David Babcock is a running while knitting pioneer! 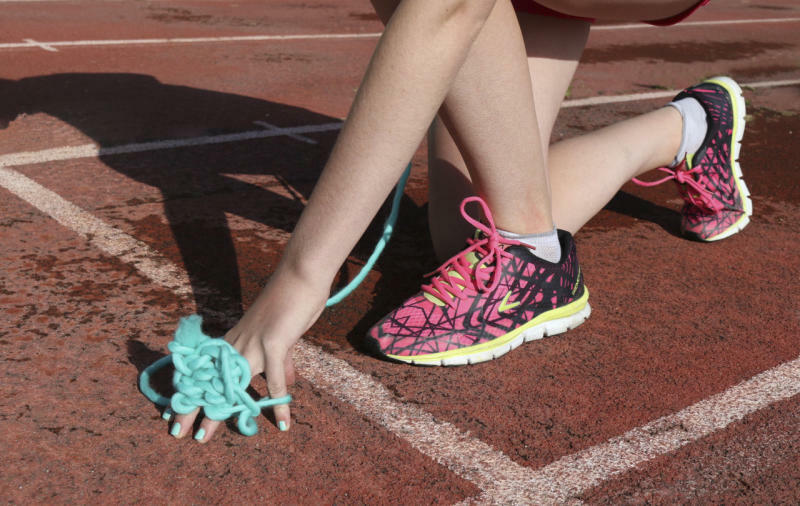 Parmalee will run the NYC marathon while finger knitting, which is a needleless variation. (Needles are banned for obvious reasons.) “I actually watched YouTube videos to see how to do it,” Parmalee says. “It’s simpler because there aren’t as many stitches to learn. You just use four fingers, leaving out your thumbs. It’s rhythmic and simple in comparison to using needles.” Parmalee knits scarves during her long training runs, then unravels them to re-use the yarn. Parmalee’s inspiration, David Babcock, 43, is a pioneer in the budding yarn-crafts-while-running movement. “My preferred running was distance, but it takes a long time. Trying to learn more about crochet and knitting—that takes a long time, too,” Babcock explains. “Normally you’re sitting on the couch for hours and hours but I didn’t have that luxury, so I thought, I’m a creative person, what if I try to do them at the same time?” Believe it or not, he wasn’t the first. A UK-based runner, Susie Hewer, set a Guinness world record in the same esoteric category, for knitting a scarf that was over six feet long. 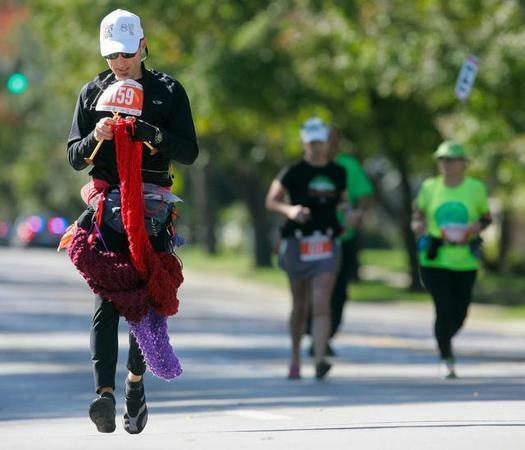 Babcock ran a few long distance races while knitting, then proceeded to smash Hewer’s record, with her blessing, by almost doubling her length with a scarf he knit during the 2013 Kansas City Marathon. Babcock isn’t resting on his cozily wrapped up laurels. Since he has already done the whole knitting-while-running-a-marathon thing, he’s switching to crochet. In a few weeks he’ll run the Kansas City marathon while attempting to crochet the worlds’ largest doily. “It’s the ultimate granny thing and should look pretty and silly at the same time,” he says. Then he’ll tackle the NYC marathon, where he’ll be finger crocheting (again, no needles allowed) small flowers, at a rate of one per mile, which he’ll hand off to spectators along the way. Babcock has been running to benefit the Alzheimer’s Association for several seasons, and the flowers are a symbol of that organization. While he hasn’t been personally affected by the disease, he took it up as a cause after learning that’s what Hewer runs for. Last year he raised about $10,000 for the organization and hopes to increase that contribution this year. Babcock, who recognizes that he’s going to end up on across social media, swears he’s not in it for the Insta-fame. “If you’re going to do something that brings you attention, you’ve got to do it for something other than yourself,” he said. “Frankly it’s been frightening, all the attention. If it was just for me, I wouldn’t be doing it.” Lion Brand Yarn Company will be sponsoring him this year. Logistically, running 26 miles with yarn is tricky, especially since bulky backpacks aren’t allowed. Parmalee wears the yarn around her wrist like a bracelet and it unravels as she goes. She plans on having someone hand off another ball of yarn to her on the marathon route. Babcock has been even more creative. For his last NYC marathon, he crocheted himself arm sleeves, then used the yarn on the sleeves for his marathon scarf, unraveling it as he went. The finished product obviously gets bulkier as you go, so Parmalee will experiment with wrapping her scarf around her neck and waist. Babcock’s flower plan means he won’t be stuck carrying tons of heavy yarn at the finish line. To donate to Parmalee’s fundraising efforts for leukemia and lymphoma, go here; to donate to Babcock’s fundraising efforts for Alzheimer’s, go here.